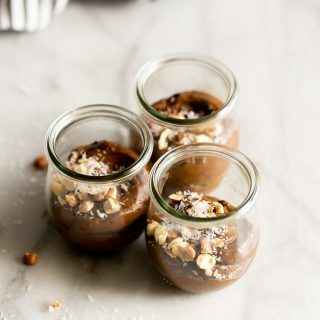 A creamy dairy-free avocado chocolate mousse made with just 5 ingredients then topped with coconut flakes and chopped hazelnuts! 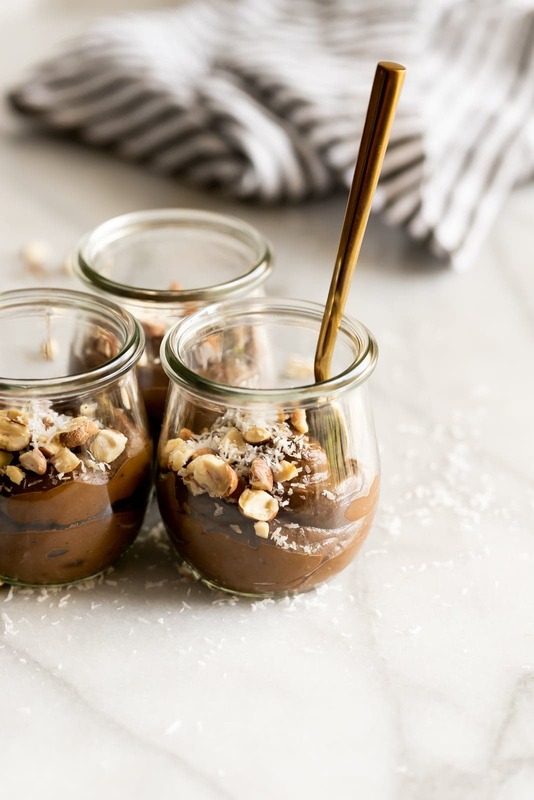 At first glance, I’m sure you’re thinking – chocolate mousse with avocado?!?! Gross. But hear me out. To make regular chocolate mousse, you need eggs and heavy cream. This makes it hard for those on “team dairy-free” to truly enjoy this decadent dessert. I have quite a few of those team members in my circle so why not make a treat that everyone can enjoy including them! Trust me, this dessert is so good, no one will know it’s healthy nor dairy-free. 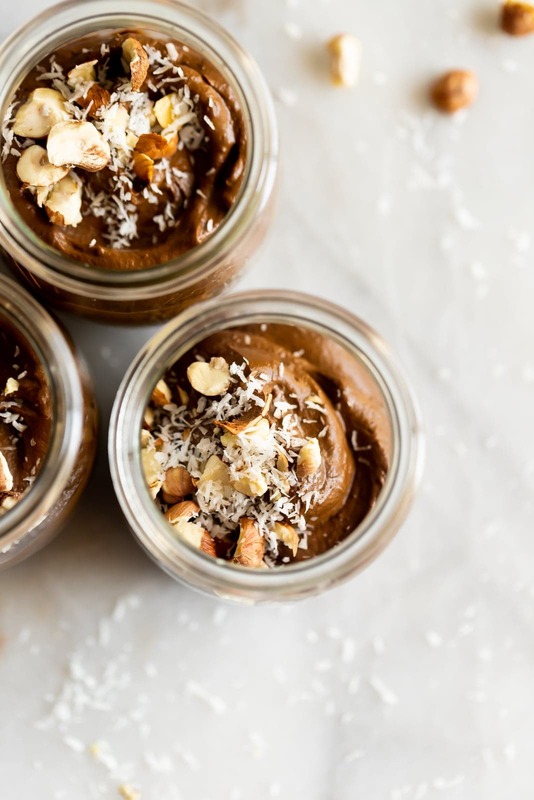 This avocado chocolate mousse is super creamy, dairy-free, vegan, refined sugar-free, and very chocolatey. I made it using Califia Farms Toasted Coconut Almondmilk which has honestly been part of my life for YEARS now. It’s soy-free, dairy-free, gluten-free, non-GMO, kosher, vegan, BPA-free. I love this milk so much and it gives the mousse a subtle hint of toasted coconut. It’s sooo good. In case you’re wondering, no, you do not taste the avocado AT ALL. I promise. The avocados are simply added to make this mousse thick and creamy. It also adds in healthy fats and fiber so win/win! Ready to see how easy it is to make this dessert? 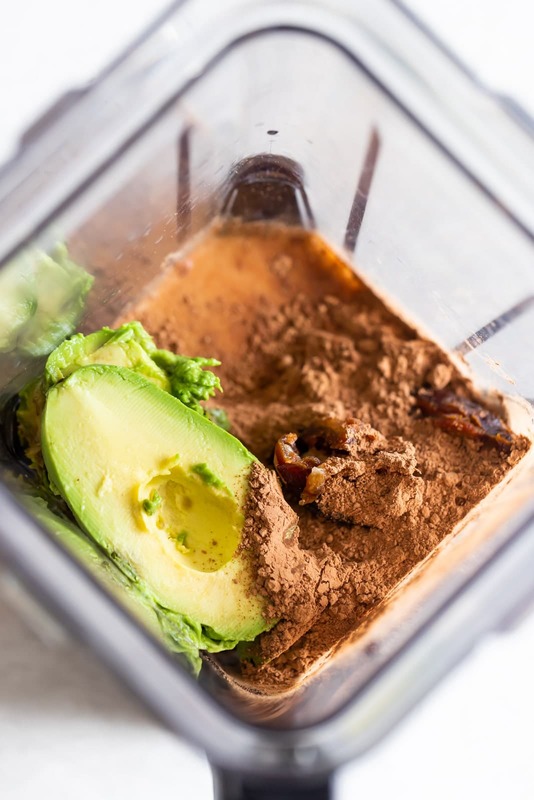 Into a food processor, add avocado, cocoa, dates, Califia’s Toasted Coconut Almondmilk, and a pinch of salt. Pulse until smooth and creamy. That’s all folks! Full recipe is below. If you don’t want to use dates, you can use another sweetener like honey, agave or maple syrup. I chose dates for this recipe because they don’t spike blood sugar, making it perfect for diabetics. My dad and my brother-in-law are diabetic so they will be able to enjoy this avocado chocolate mousse! That makes me happy. 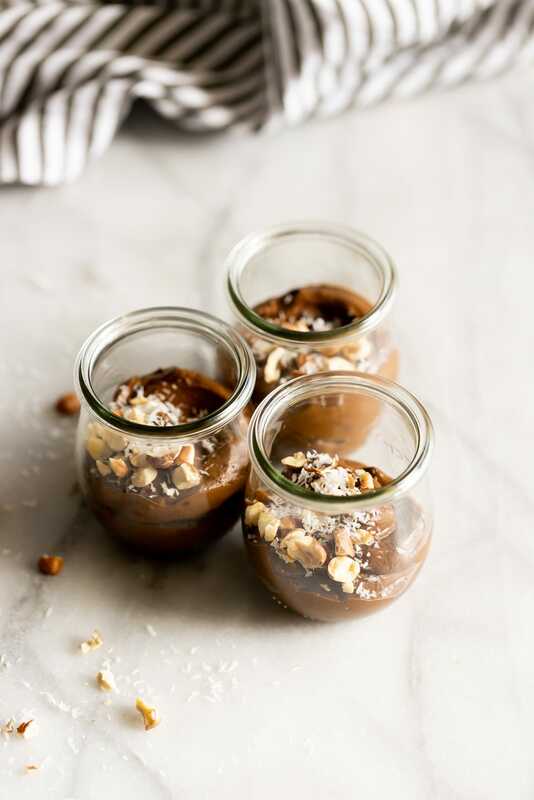 Once you transfer the mousse to the jars, you can garnish it with chopped hazelnuts and coconut flakes. Feel free to use almonds instead. I just love hazelnuts so much. Can’t wait for you guys to make it! 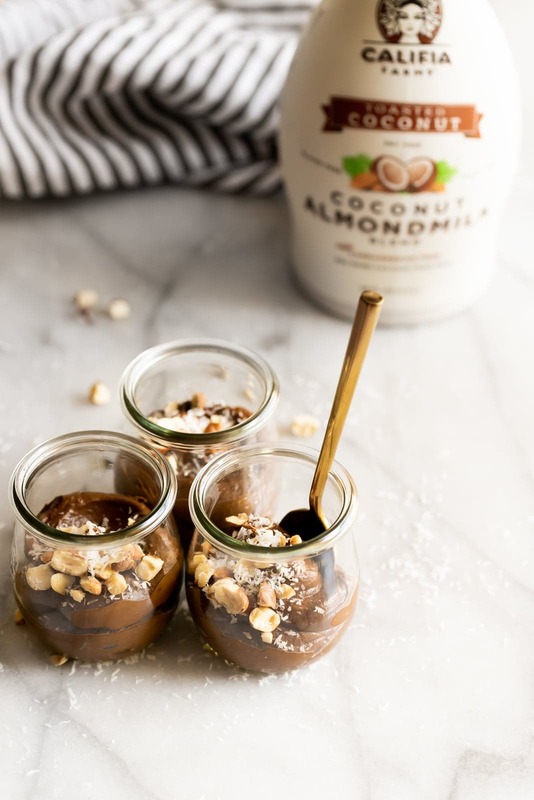 Interested in snagging up some Califia Toasted Coconut Almondmilk for yourself? Click here to shop and use code SASSYSPOONxCALIFIA for 15% off + free shipping on your order! In a food processor, add avocados, cocoa powder, dates (drained) or sweetener of your choice, Califia Farms Toasted Coconut Milk and salt. Pulse until well combined and smooth. You may have to scrape the sides of the food processor with a spatula and pulse again. Transfer mousse to jars and garnish with coconut flakes and chopped hazelnuts. Enjoy! 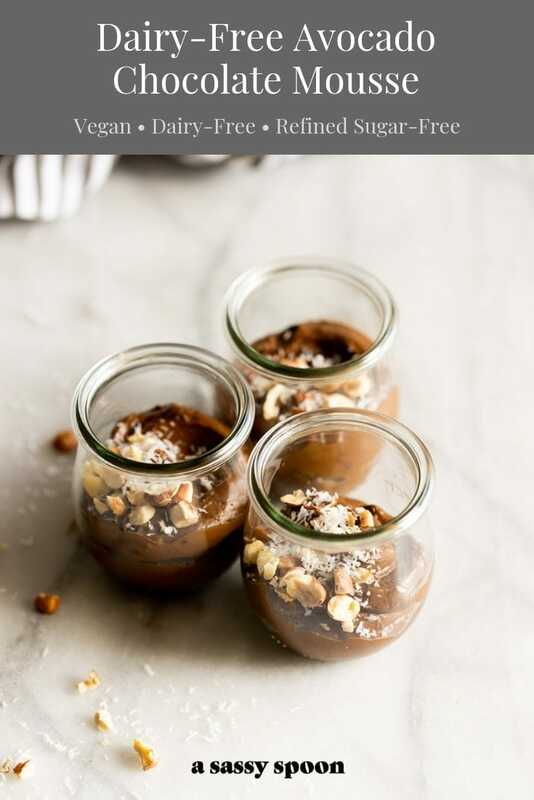 *The avocado chocolate mousse lasts about 1 week in the fridge in an airtight container. This looks so chocolatey! And easy – a delicious creamy mousse I don’t have to cook or whip for ages…sign me up!